During the first full week of 2016 we have been thoroughly enjoying asian-inspired food. I find these dishes really quick and simple to prepare, and often involve just one or two pans which keeps the washing up to a minimum which is a plus. Everything takes 30 mins or less to prepare so I can spend more of the late afternoon with the kids. Everyone enjoys the meals which makes me happy. Alexander doesn't really care for sweet potato which has always been a staple carbohydrate addition to our weekday meals, so it makes a difference seeing him heartily tucking into bowlfuls of rice, or noodles with vegetables and flavourful sauces. This has got to be one of my go-to quick marinade/dressing/glaze for any meat or fish. As long as I have soy sauce, lemon juice, ground ginger, rice wine vinegar, sesame oil and honey in the cupboards I can prepare a quick sauce which can be added to chicken or salmon which can marinate for 20 minutes to an hour whilst I cook rice or rice noodles. Quick and simple and delicious. Trying to eat up the pickles and chutneys from Christmas. We have been enjoying beef in oyster sauce since the end of last year. Rob had such a hankering for it and now it is regularly requested. I marinate the beef for at least 20 minutes in cornflour, sesame oil, rice wine vinegar and soy sauce before frying it and the sesame oil really adds a delicious nutty flavour. A highly requested meal from Rob and the kids. I love it too. Here I have served it with stir-fried mixed vegetables and brown rice. Super easy to prepare, using a handful of ingredients which I have in my cupboards. I simply brown a pack of beef mince and drain the excess fat then pour over the sauce which is a combination of sesame oil, ground ginger, lemon juice or rice wine vinegar, soft brown sugar, miso or soy sauce and garlic granules. Then it all sizzles together for around 10 minutes. My second attempt at this dish and this was requested for a weekend lunch because it is so quick and makes a change from one of our firm favourites of gluten free pasta and dairy free pesto. This time I served it alongside instant rice vermicelli which takes just 3 minutes to cook in a bowl of boiled water. Last month I found a lot of chicken breast reduced in Sainsbury's, so I picked up a couple to put in the freezer. I saved a lot of money which made me happy and as long as I know what I plan to cook I can pull packets out of the freezer as and when. Wagamama used to serve a dish called Amai udon a few years ago so that gave me the idea to make a sweet amai sauce to stirfry chicken and vegetables in. I tend to just make these sauces by eye now and I don't use any cup measures for example, just wing it! Brown sugar, tomato ketchup, sesame oil, rice wine vinegar, soy sauce and garlic granules made up the sauce and the addition of peanuts (just for me and Rob) made it really tasty and reminscent of our early Waga dates. An example of a more typical meal for us was Saturday's chicken breast stuffed with lactofree cream cheese and wrapped in streaky bacon. Rob cooked this meal, and you can tell that he served it! Tasted pretty good. I have attempted many times to phase the white rice out by planning to buy brown rice, but the idea hasn't always been well-accepted by Rob, who would proceed to buy a very large bag of white rice when stocks were low. It takes 45 minutes to cook which means that meals which has brown rice as an accompaniment take a lot longer than 30 minutes from start to finish. I toast the cup of brown rice in sesame oil first then add 2 cups of water, a pinch of salt, cover then boil. Then I lower the heat and let it cook away for 45 minutes until there is just a little water at the bottom. Then I turn the heat off, fluff it up with a fork and the last of the water seems to get absorbed. If I fancy egg-fried brown rice I just transfer it to a frying pan with a smidgen of oil and crack in two large eggs, allow them to go white, then break it all up together with a wooden spoon. We have recently done some research and discovered that Rob can eat buckwheat, so we have enjoyed buckwheat soba noodles which are delicious and nutty but just don't look incredible. A bit muddy looking, but if combined with vegetables stir-fried in a sauce the colour really doesn't matter. I found a pack of lamb steaks in Sainsbury's in the clearance aisle so into the freezer they went. They came with an oval-shaped pat of garlic and herb butter which was easily removed and hadn't leaked all over the meat. If I wasn't confident about it I would have kept the lamb for another meal time when Rob is out which is usually one evening in the week. But there were no ill-effects thankfully and this traditional meat, carbs and veg meal was thoroughly enjoyed with some homemade gravy and mint sauce. I cooked a lentil and cauliflower curry which had two small sweet potatoes in it. It tasted really good and even though it was quite mild, my nose still ran! The next day I added some more water and crushed the veggies to make a soup which was just as tasty for a quick, filling lunch. This curry provided leftovers which made a great soup. 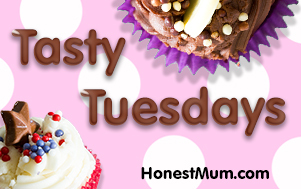 I got involved with Tasty Tuesdays, check it out if you would like to have a look at other posts all to do with deliciousness.